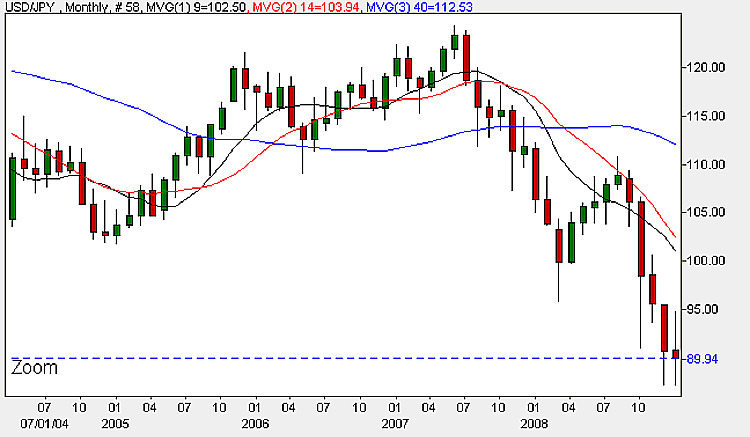 The candle for last month is interesting, as it gives us a clue to the future direction for the dollar yen pair. Following four months of wide spread down bars, last months bar is a long legged doji, which as I’m sure you know, represents indecision in the market, and a possible turning point for the current trend, and is one of the most significant indicators we have in our technical analysis tool kit. As always we will need to wait for the signal to be confirmed, but the likelihood of a reversal increases with the doji if the following conditions are met. Firstly subsequent candles confirm that the trend has reversed, secondly the market is overbought or oversold, and thirdly that the doji is one of only a few, not one of several. In this case we have very few doji candles in close proximity, and can therefore consider this as a significant signal. All we need to do now is to wait for the confirmation in the following month before deciding whether to trade in the longer timescale. In a sense what the doji does, is provides us with an early warning, a “pay attention” signal if you like, that provides us with an alarm that something may be about to change in the dollar yen pair !